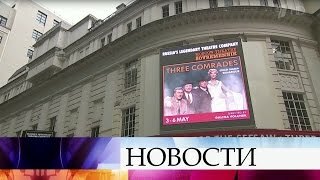 Moscow's critically acclaimed and internationally renowned Sovremennik Theatre returned to the West End in May 2017 with a triple bill of its most celebrated productions, Three Comrades, Two for the Seesaw and Three Sisters. Directed by Galina Volchek, (Artistic Director and founding member of the Sovremennik Theatre) regarded as one of Russia's greatest theatre practitioners, all three shows will be performed in Russian with English surtitles. The Sovremennik is one of Russia's most respected theatres, recognised around the world for its tradition of staging intense psychological dramas, and its bold productions of contemporary plays, Russian classics and international work. The London season featured a cast and crew of over 100 people including the acclaimed Russian film, theatre and television actress and humanitarian Chulpan Khamatova. Adapted for the stage from the novel by Erich Maria Remarque, critically acclaimed author of All Quiet on the Western Front, Three Comrades portrays the greatness of the human spirit, manifested through characters who must find the inner resources to live in a world they did not make, but must endure. Set in Germany 1928, at the height of the depression three men struggle to make a thin and precarious living as mechanics, friendship the only refuge from the chaos and upheaval around them. Robert Lohkamp, a disillusioned figure whose outlook on life is marred by his horrifying experiences in the trenches during the First World War, finds his nihilistic outlook start to change when he meets a beautiful and mysterious young woman. A Russian twist on the poignant and compelling American drama Two for the Seesaw is performed by two of the country's greatest actors, Chulpan Khamatova and Kirill Safonov. Set in New York, the play follows the course of an intense and tempestuous affair between a brooding Nebraska lawyer who has relocated to the Big Apple to escape his marriage, and an eccentric dancer he meets at a party. Their relationship comes into jeopardy as their lingering ties to previous partners and the differences in their backgrounds and temperaments come to the fore. Critically acclaimed the world over, and winner of a Drama Desk Award, The Sovremennik's Three Sisters is widely regarded as one of the seminal versions of Anton Chekhov's classic tale, enthralling audiences from Paris to New York, Berlin to London.